General Motors recalls nearly 27,000 vehicles that may suddenly lose their power steering. 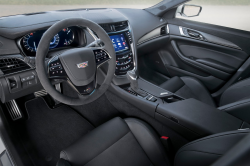 March 13, 2019 — General Motors power steering problems have caused a recall of nearly 27,000 model year 2016-2018 Cadillac CTS, 2017 Cadillac ATS, 2017 Chevrolet Camaro and 2017 Chevrolet Corvette vehicles. The electric power steering may fail while driving and cause the vehicles to revert to manual steering, making turning the steering wheels much more of a chore. A loss of power steering while driving slow speeds or around curves can easily cause a crash. GM opened an investigation in September 2018 into sudden power steering losses in 2017 Chevrolet Camaros based on information from the National Highway Traffic Safety Administration. Engineers determined intermittent electrical problems occurred in the torque sensor printed circuit boards of the power steering gear assemblies in about 80 percent of the cases. The gear assemblies were supplied by Bosch, and additional investigations also found the same problems in two Chevy Corvette steering gear assemblies. By analyzing the data GM found the same circuit boards were installed in Cadillac ATS and CTS vehicles. This was followed by spikes in warranty rates that were traced to manufacturing errors made by the power steering supplier. The automaker says a loss of power steering can last the entire time the vehicle is running, but it's possible power steering while return once the vehicle is restarted. A driver should see a message and hear a chime within a few seconds of losing electric power steering. The recall starts in March 2019 when GM dealerships will replace the power steering gear assemblies. Affected customers may call the automaker at 800-222-1020 and refer to recall number N182182760. CarComplaints.com has complaints about the Cadillac CTS, Cadillac ATS, Chevrolet Camaro and Chevrolet Corvette.